Triangle-shaped sanding pad for efficient sanding of corners and other awkward spots. Significant time saving and less reworking. The enclosed dust proof bearing and high tear-resistant MPE sanding pad ensure a long service life and maximum economic efficiency. Effective integral turbo dust extractor. Small, lightweight and extremely handy for non-tiring work. Ideal for vertical surfaces or overhead work. Sanding natural wood and veneer prior to varnishing. One-handed sander for small surfaces, edges and tight corners. This sander truly is about as good as it gets. It's light, compact, powerful and easy to use. 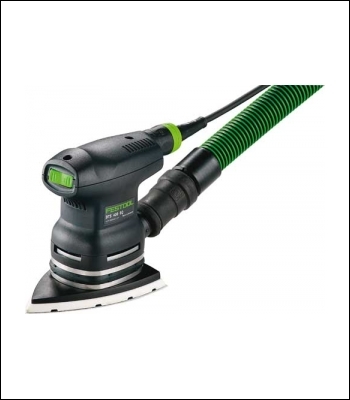 It complements the festool vac superbly and has so little vibration you could literally use it all day. Very impressed!